Join us as we recap Hieron and get ready for Spring!! 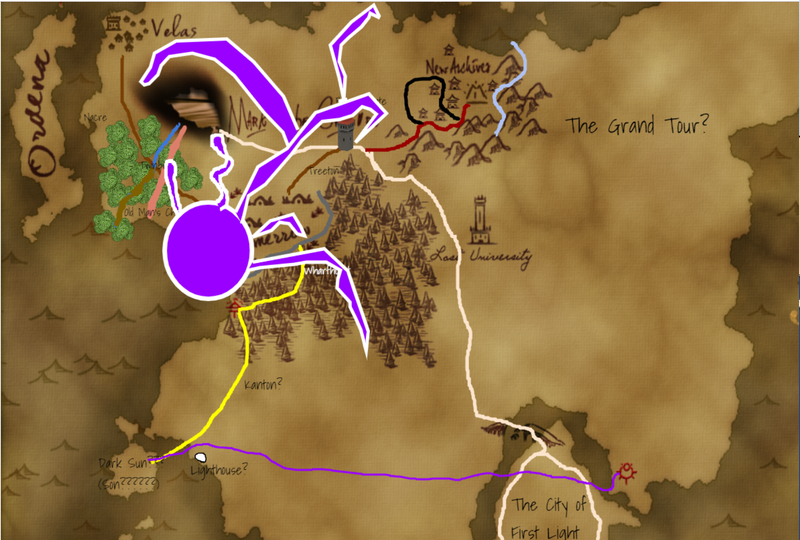 Today’s plan is to go over Hieron, check out some old maps, and fill in a lot of gaps. Think of this as a combination of recap and world building: If there are questions about the world and how it works or things that are “true,” now is the time for us to address them. Our current Dungeon World campaign takes place in the world of Hieron, a land still healing from a great calamity that struck centuries ago. Our characters only know this event as "The Erasure" but no one knows quite what happened, or just how long ago but the land carries the scars--both figuratively and literally. 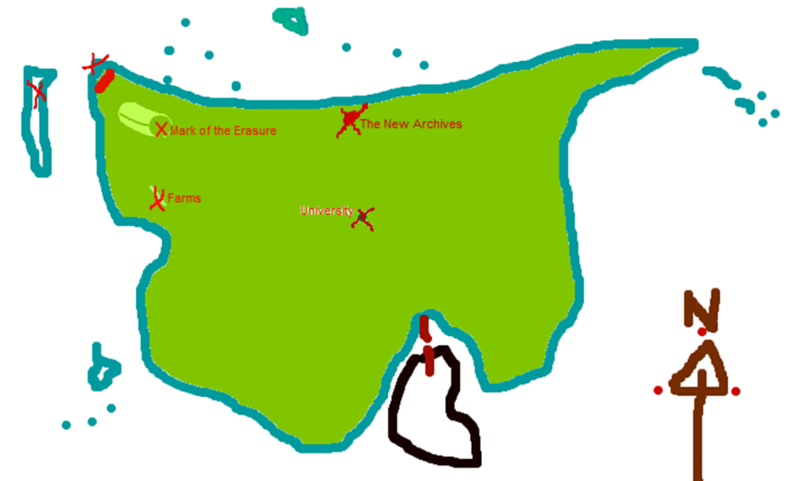 Fero Feritas comes from the Halfling farms inland of the south western coast of the continent. Running from the bitterness of barely remembered nostalgia for the old ways, whatever those were, Fero cloaks himself in new wilderness of his land, wandering and learning. Walking in shadow and step with the beasts of the woods and mountains for so long Fero hardly noticed when he became one himself. 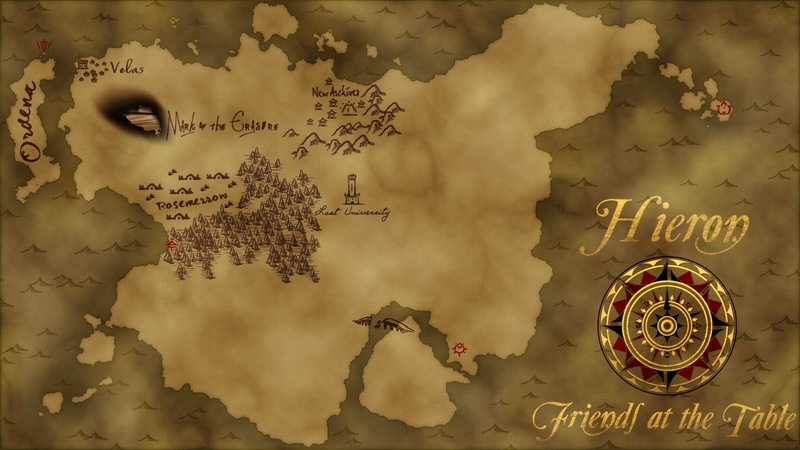 This new world may look like the old one, but Fero will not go back. He bears this new wilderness upon him. The Great Fantasmo, the elfish wizard will have a bio soon. Hadrian, Sword of Samothes, Defender of the Undying Fire, Officer of the Order of Eternal Princes, the human paladin will have a bio soon. Hella Varal is a human fighter from the magicless island of Ordena, the land spared from the Erasure, or so they say. She grew up with simple means but her role as a hired hand and conveyor lead her to gain respect and the attention of the government of Ordena, the reason for her frequent visits to Velas. Armed with a beautiful, mysterious sword, a lack of patience, and wariness of her people, Hella is a useful but unpredictable companion. Lem King is an orc bard, born and raised in The New Archives, a vast orc city carved into the side of a mountain. The archivists, and Lem, prize collection and categorization of histories and objects and whistled songs; the Archives resemble a warehouse or museum more than a city. Recent events, however, have led Lem to flee the archives, clutching an old violin, and he's arrived in Velas looking for adventure and excitement and (perhaps) somewhere to hide. Throndir, the Elfish Ranger, hails from the secluded settlement of Auniq deep within the Mark of Erasure. After seeing something he was never meant to, Throndir fled the only home he had ever known and began to rebuild his life in Velas. Alongside his loyal dog, Kodiak, Throndir’s sharpened survival skills has earned him a spot on the team, but his naïve nature and clouded past leave more questions than answers about what’s in it for him.